What's Next: The Trans-Pacific Gilded Age: Five of the world's biggest companies are expanding their empires, consolidating control and moving ever closer to a monopoly or duopoly status that threatens to squash competition and give them unchecked influence over the most essential business and consumer services. 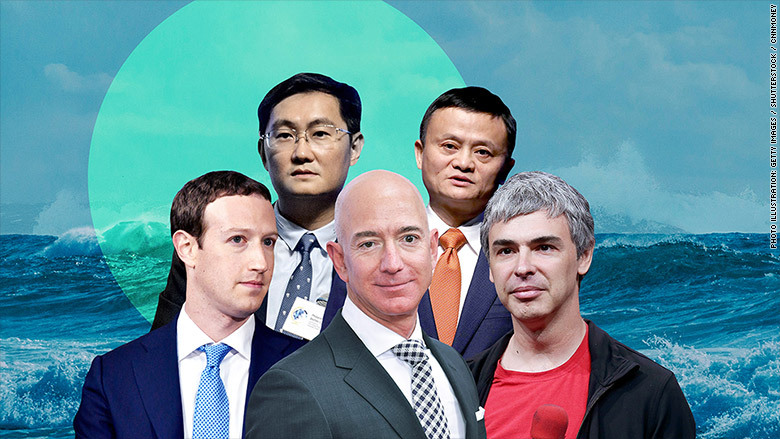 The five companies -- Alibaba, Alphabet, Amazon, Facebook and Tencent -- are at the forefront of a new Trans-Pacific Gilded Age in which US and Chinese companies wield immense influence over commerce and trade. They are also likely to have immeasurable influence over politics, given their spending power and lobbying resources, and culture, given the infiltration of their products and services into nearly every aspect of our lives. We believe their power is unlikely to be checked in either country, because the Chinese government supports their rise and the US government isn't going to impose tough regulation right now. We also agree with the McKinsey Global Institute's assessment that these companies have a long-term "insurmountable advantage" because of their ability to invest heavily in future technologies like AI and robotics. • Facebook, Alphabet and Amazon are enjoying "profit margins, market dominance and clout that, according to economists and historians, suggest they're developing into a new category of monopolists." • "They may not yet be ripe for such extreme regulatory action, but as they consolidate control of their markets, negative consequences for innovation and competition are becoming evident." • "Apple is considered more vulnerable to competitive disruption, despite the fact that it tops the tech world in revenue, profit and market capitalization." • Tencent and Alibaba "are ratcheting up their no-holds-barred contest to dominate the ways 770 million internet users communicate, shop, get around, entertain themselves and even invest their savings and visit the doctor." • "China's internet titans have a powerful ally [in] the Chinese government. Tencent and Alibaba have avoided antimonopoly clampdowns by staying in Beijing's good graces ... Their sheer size also makes them easier for the authorities to control." The Big Picture: The new Gilded Age is global, split between tech companies in the world's two biggest economies. As they compete for control of Asia, Africa, Latin America and Europe, their wealth and influence will balloon to levels even more unthinkable than the levels they're at now. Details about Apple's WWDC conference are continuing to leak ahead of the June 4 keynote. Apple is reportedly working on an initiative called "Digital Health," which enables users to monitor how much time they're spending on their devices. It's also reportedly looking to expand its digital advertising business with a new network for apps. JUST IN: "Google will not seek another contract for its controversial work providing artificial intelligence to the U.S. Department of Defense for analyzing drone footage after its current contract expires," Gizmodo's Kate Conger scoops. • "Google Cloud CEO Diane Greene [told employees] Google would not choose to pursue Maven today because the backlash has been terrible for the company ... adding that the decision was made at a time when Google was more aggressively pursuing military work." • "The company plans to unveil new ethical principles about its use of AI next week." • "Thousands of employees ... signed a petition asking Google to cancel its contract for the project, nicknamed Project Maven, and dozens of employees have resigned in protest." The Backstory: The move comes just days after The New York Times that the Maven project was creating internal strife at the company. The Big Picture: As we wrote two days ago, the growing public awareness and concern about big tech's government contracts is likely to become a public relations crisis for America's tech giants because that work seems to conflict with their stated moral values. • "The push for news shows, which will be a mix of daily and weekly formats, is part of Facebook's 'broader push to help reliable information drown out fabricated articles and rumors on the platform.'" • "Possible shows from Shepard Smith of Fox News, CNN, WSJ, BuzzFeed and NowThis, among others." • Facebook is financing the shows and asked potential partners "to detail their ethical standards, including corrections policies, people familiar with the talks said." Facebook has also announced it will shut down its trending topics section. The Big Picture, via my colleague Seth Fiegerman: "Facebook [is] rethinking how news is presented on its platform after more than a year of criticism over fake news and election meddling." The Bigger Picture: The majority of US Facebook users use the platform as a source for news and information, according to Pew Research. The Watch feature has immense potential to burnish Facebook's news credibility and expand the reach of media outlets' programming. Facebook shareholders went hard on Zuckerberg and other top Facebook execs over data privacy, election meddling and corporate governance at the company's annual shareholder meeting Thursday. • Christine Jantz, chief investment officer at NorthStar Asset Management: "If 'privacy is a human right,' as stated by Microsoft's CEO, then we contend that Facebook's poor stewardship of customer data is tantamount to a human rights violation." • Another attendee asked if Facebook's board would "commission a study to evaluate the impact on shareholder value of breaking up Facebook's business line" given recent regulatory scrutiny into the company's data practices. • Outside the meeting space in Menlo Park, California, a group called Freedom From Facebook flew a plane carrying the banner: "You broke democracy." • "Your biggest competitors are three out of the four biggest market cap companies in the world" -- Apple, Amazon and Google. • "Fundamentally, the content you're offering is the same." • "You don't have a mobile phone, you don't have home devices. So in the longterm, what is to stop Apple, Amazon, Google from basically pushing you out of the market by virtue of the fact that they can bring this music to scale to more people?" • "Well, I think when you look at that, about the competitive set that we have, I think you could almost universally say that's true about all internet companies." • "The way we think about it though, is one of their real important things is that it remains ... that these platforms remains open." • "When we compete on equal terms with all of these companies, we tend to do pretty well. So that's our focus, is keeping this platform open because we think it's in the interest of customers and obviously we know that we do well when that's the case." In other words ... Ek didn't exactly address the question. At some point Apple, Amazon and Google could be able to box Spotify out because they can offer the same content -- music -- to their users in a more seamless way. That, or one of these three companies buys Spotify. We have yet to hear a reasonable explanation for why that's not the end game. The Big Picture: Even an extraordinarily successful company like Spotify is vulnerable to the overwhelming power of the big tech giants. Bonus: Spotify has changed its "hate conduct and content" policy, again. • "The company is launching Jetblack, a new personal shopping service that lets customers order items via a text message with same-day or next-day delivery." • "For now, the invite-only service is only available in parts of New York City and costs a hefty $50-a-month." • "Walmart is positioning the service for 'time-strapped urban parents' that delivers items from Walmart, Jet, Saks Fifth Avenue and other New York shops." The Big Picture, via Valinsky: Walmart and Amazon are at war for consumers both at home and abroad. Jetblack is part of Walmart's 'two-Americas' strategy: Promoting non-Walmart branded companies like Jet, Bonobos and ModCloth to attract urban dwellers while boosting its own website with grocery delivery and expanded inventory. Talk of Tinseltown: Could DOJ beat AT&T? • "A government win would be considered a major upset. That doesn't mean it can't happen." • "Looming over this deal are AT&T's size and influence in cable, wireless and satellite communications. ... The heart of the government's case is that AT&T, because of its size and power, can weaponize popular Time Warner content like HBO, CNN and sports programming to harm competitors and ultimately drive up prices." • "Being too big and powerful isn't illegal, but it often sets the tone for antitrust actions." The Big Picture, via Stewart: "A pipeline has filled with megadeals awaiting the case's outcome." What Next: The new Time Magazine cover. The iconic title and frame are made up of 958 drones. Here's how it came together.